Most people in the Tampa Bay area know about our long and intriguing history with the Ringling family of Ringling Bros. and Barnum & Bailey Circus fame, but we wager to guess that our connection to the Greatest Show on Earth™ may be a surprising bit of history for other Americans and our international visitors. It just so happens that the Ringling Museum in Sarasota is the state art museum of Florida, and its campus also hosts the Ringling Museum of the American Circus, which John Ringling established in 1948 to preserve circus history and elevate the status of circus arts from its traveling vaudeville reputation to a viable performing art form. According to the Ringling Bros. and Barnum & Bailey website, John Ringling and his brothers, the Wisconsin counterparts to the famed circus duo of P.T. Barnum and James Bailey, became known as the “Kings of the Circus World.” Their show, a titillating pile of superlatives titled “Ringling Bros. United Monster Shows, Great Double Circus, Royal European Menagerie, Museum, Caravan, and Congress of Trained Animals” played in their home state and Illinois in 1887. Their show took to the rails two years later, in 1889, a full 17 years after P.T. Barnum launched his equally superlative “P.T. 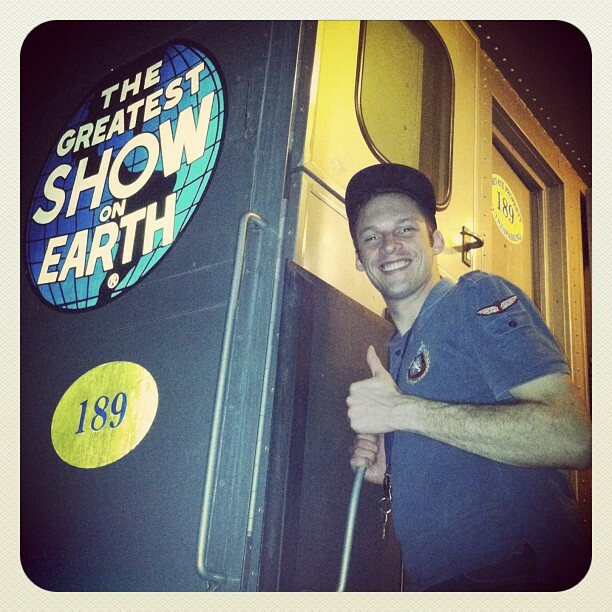 Barnum’s Traveling World’s Fair, Great Roman Hippodrome and Greatest Show on Earth” across America on the railroad. By the time the Ringlings caught up with Barnum, there were 12 circus trains traversing the American tracks, taking the eye-popping spectacle of the big top to small town and big city America. With the simultaneous promoting powers of the Barnum/Bailey empire and the Kings of the Circus World chugging over the country, it is no wonder that the traveling circus and the circus-comes-to-town motifs captured the hearts and imaginations of the American public. 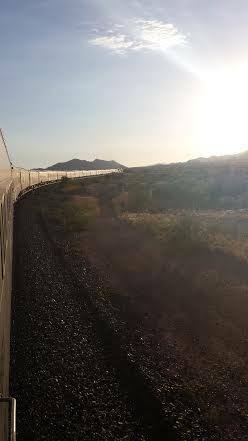 The circus, and the circus train, embedded into our cultural psyche. The fantasy of the circus traveled on its own rails across the minds of the generations, carrying the notions of running away, joining the circus, and spending life surrounded by fascinating people and the daily adventure of waking up in a new town. By 1907, the Ringlings had acquired the Barnum & Bailey enterprise (both patrones had died; Barnum in 1891 and Bailey in 1906). Twenty years later, John Ringling and his wife Mabel found an over-wintering site for their massive circus conglomerate on the shores of the Tampa Bay in a small Florida paradise called Sarasota. Today, Sarasota bills itself as the Circus Capital of the World, and the train used to transport the still-thriving circus parks for a long holiday break in Port Manatee, an old Florida port between St. Petersburg and Sarasota. Today, the Greatest Show on Earth™ belongs to Feld Entertainment, a 21st century entertainment conglomerate worthy of its predecessors, which is headquartered in Ellenton, FL. They run two circus trains, a Red Unit and Blue Unit, which tour for two years at a time before getting revamped with a new show. 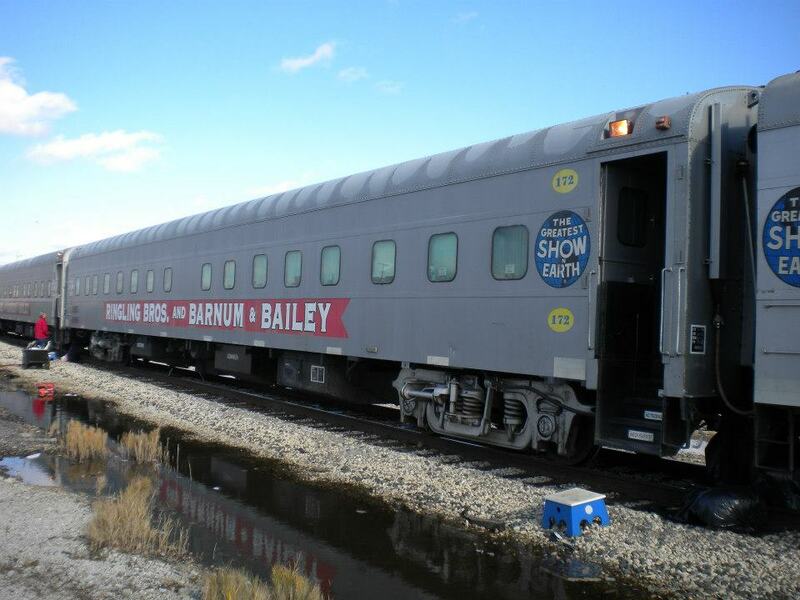 Over a mile long and comprised of anywhere from 50-60 cars, each train literally carries on Barnum & Bailey and the Ringling Bros. traditions of caravanning the circus all over the country to thrill and amaze audiences with death-defying acrobatics, animal acts and—of course—their trademark cadre of clowns. We found this interesting article on the chef of the Ringling Bros. and Barnum & Bailey train, who makes 1500 meals a week and is the only member of the 300-person “traveling city” who gets real whipped cream for his birthday pie-in-the-face (it’s a circus train, people) instead of shaving cream. 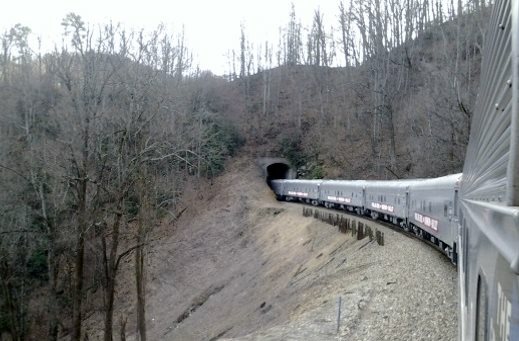 In compliance with full disclosure, Caught in the Act would not have known anything about this performing arts obscura known as the circus train had it not been for Matthew Belopavlovich, one of our beloved theater faculty members at the Patel Conservatory, who did the very thing P.T. Barnum embedded in our collective subconscious: he ran away and joined the circus. As a clown. 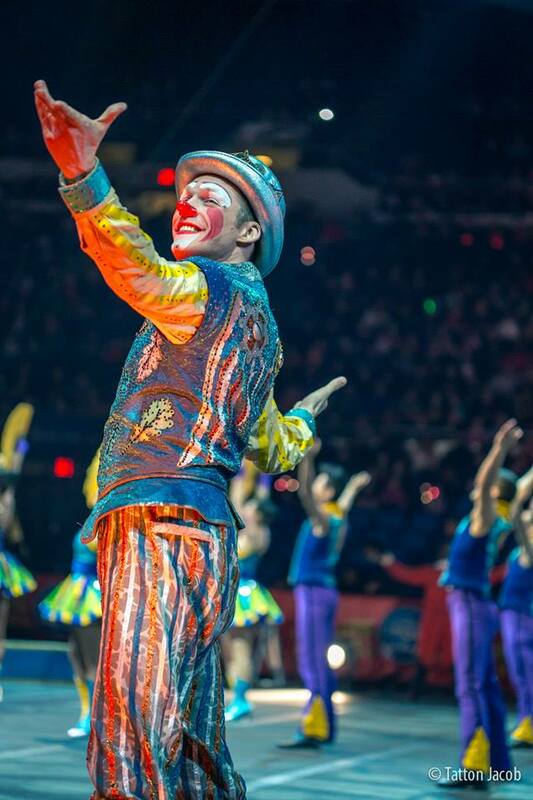 Matthew’s lifelong dream to perform as a clown with the Ringling Bros. and Barnum & Bailey Circus came true a few years ago when he won a spot with the show during an audition in the middle of Grand Central Station. He attended clown college, now more of a “clown boot camp” he says, and boarded the train for a two-year adventure around the country as part of the 142-year-old tradition. Naturally, we were curious about sleeping arrangements and if everyone was grouped on the train according to skill set. Article clipping from Americana Magazine, December 1987. In November 1986, the Iran-Contra scandal broke in the Lebanese media, quickly spreading to international headlines. With key players such as Oliver North, Fawn Hall, President Reagan and the Nicaraguan Contras, that drama cast a sour shadow over American politics and government. Needless to say, it was bad timing for a romping musical about beloved president Theodore Roosevelt’s wily relationship with his insouciant, teenaged daughter, Alice. The musical, Teddy and Alice, inspired by that true tale, had its tryouts at The Straz before heading to Broadway for a two month run. The show focused on Roosevelt’s inability to run the country while containing his irrepressible daughter, and he chose the former job, but not without paying the personal price of an outspoken, free-spirited daughter in love with an ill-favored match in the form of Ohio representative Nicholas Longworth. Reviews were not favorable to the show, mostly citing too much one-dimensional painting of Roosevelt outside of his political and historical context. Perhaps, in 1987, reviewers merely wanted more truth about a president than what was revealed? Or maybe, as it happens in any industry, the product just missed the mark. 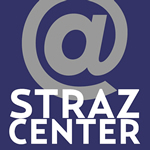 Either way, The Straz, then and now, proudly supported the premiere of the show—without new works, performing arts in America will not evolve, grow or expand to the next level. As with any business, supporters of the arts must be bold enough to take risks. Tampa’s very own Hinks Shimberg, a long-time supporter of The Straz whose family also produced the original production of Oklahoma!, produced the show and helped it mount on Broadway. The show ran November 12, 1987 to January 17, 1988 at the Minskoff Theater. In December 1987, Americana Magazine’s Hilary Ostlere promoted the musical’s Broadway run with an interview of the playwright, Jerome Alden. According to the article, Alden, who had previously written a one-man show about Teddy Roosevelt called Bully! states: “When they came up with the idea for Teddy and Alice … it was as if T.R. bit me and I went mad, as someone once said.” Alden completed the book, and the musical was scored to John Philip Sousa tunes. Notably, Alden also wrote “Bicentennial Minutes,” a series of short history lessons for CBS in 1976. He died in Manhattan in 1997 from kidney cancer. He was 76 years old. The original Teddy and Alice starred Len Cariou as the president and newcomer Nancy Hume as his daughter Alice. The show was revived as recently as 2012 by Seven Angels Theater of Waterbury, CT. 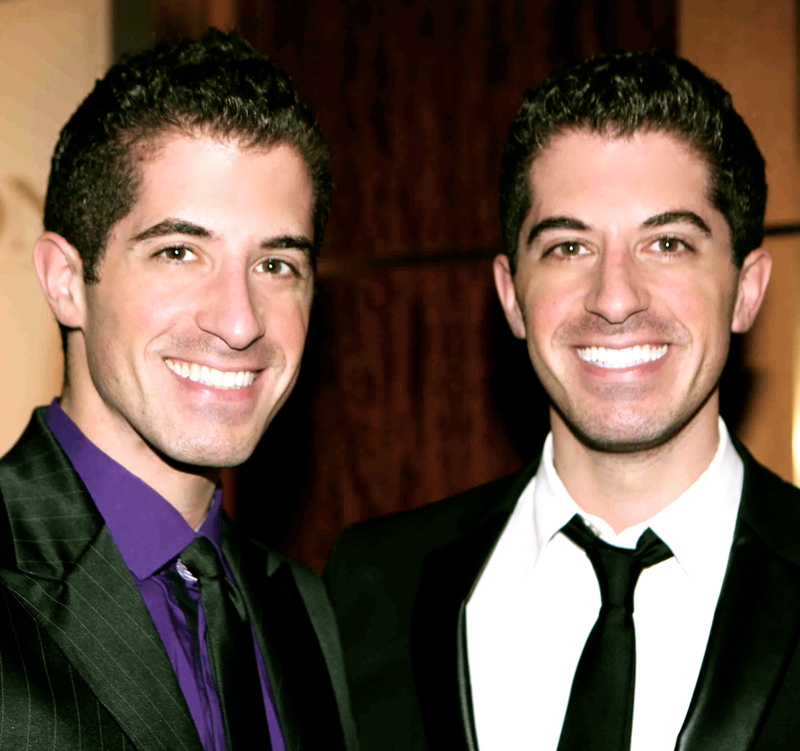 Rarely do we get twins performing together on stage at The Straz, so it is a double (quadruple?) 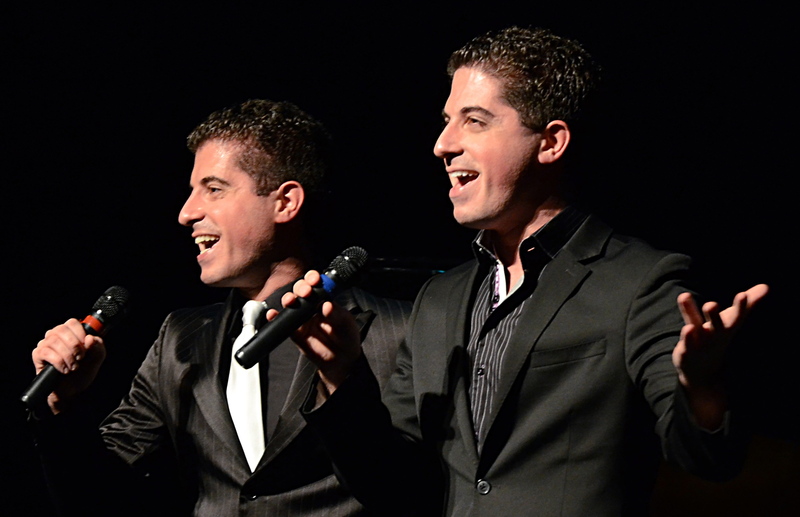 treat to have Will and Anthony stopping by the Jaeb this Saturday for their cabaret show. We thought we’d celebrate this rare occasion with some interesting factoids about twins from around the world. We also threw in a few interesting factoids about Will and Anthony, just for fun. The Aztecs were not as generous. One twin was killed to save the life of a parent and the other was thought to possess evil powers. No bueno. The Lillooet tribe believes bears are the parents of twins. Some famous mythical twins include Romulus and Remus, suckled by wolves in ancient Rome, and, of course, the Weasely Brothers, of Harry Potter legend. There’s also Gilgamesh and Enkidu, Artemis and Apollo, and the Hindu Ashwini Twins, who act as Healers. Will and Anthony got their start on stage playing Judas and Jesus in Godspell. Wait til the show, and they’ll tell you who was who. Their mother told them apart by dressing one in red and one in blue. Their first professional gig was stealing (inadvertently, of course) a Cheerios jingle from the Harlem Boys Choir. They played with Upright Citizens Brigade. They are charming. They are funny. They are good-looking. Seems like they prove a lot of the twin mythology just may have more than a little grain of truth. 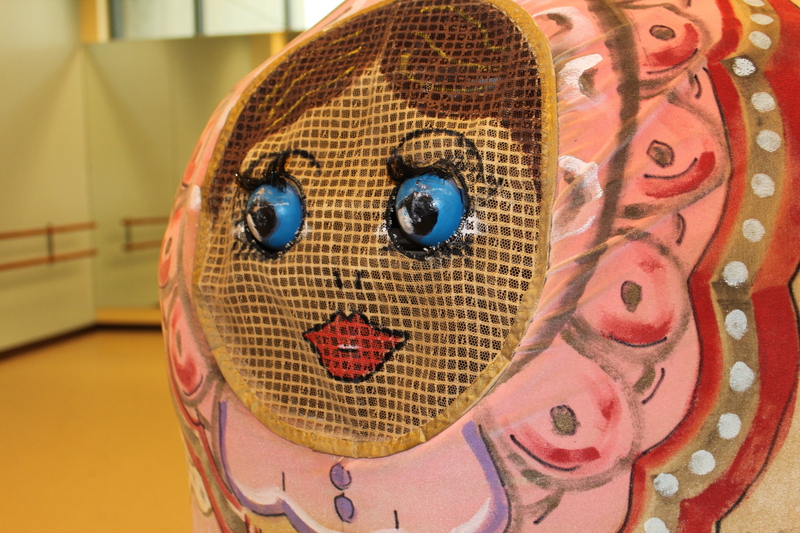 Mother Matryoshkas on Morsani Hall stage at the Straz Center during Next Generation Ballet’s Nutcracker. Among the whip-thin ballerinas performing grand jetés and assemblés in the Russian Imperial ballet of the Nutcracker, loom the rotund, bouncing figures of the Mother Matryoshkas—eight Russian nesting dolls, appearing in descending order of height and girth. 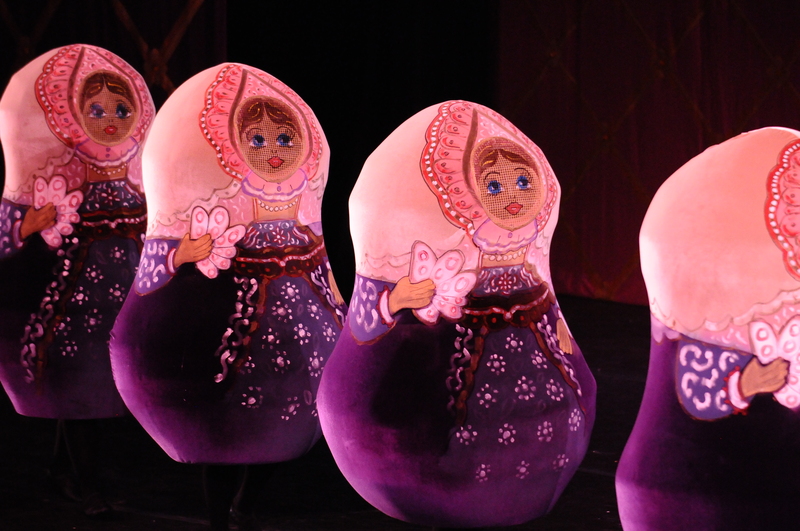 The Matryoshkas–meaning “little mother” in Russian–appear on stage in the dream sequence along with their “children,” the polichinelle acrobats. Different productions of The Nutcracker include a Mother Ginger—typically performed by a tall, male performer with loads of make-up, and wearing a huge hooped skirt—from which the children run out. But the Nutcracker production at the Straz Center utilizes the nesting dolls as their symbol of family and holiday togetherness. The Matryoshka costumes are constructed of a plastic web framework covered with 2 inch thick foam padding, elaborately painted on the outside. Inside at the top is a hardhat with a chin strap—in essence, the performer balances the costume on her head and steers with two door handles mounted on either side. Vision is limited to an eight-square-inch piece of mesh—the face part of the costume. Visibility of those in the Mother Matryoshka role is limited to the mesh opening of the costume. The largest of the dolls, the Mother of all mothers so to speak, has blinking eyes (operated by a lever inside) and an opening through which the performer flutters a fan at her entourage. The performer in this role can best practice by patting her head and rubbing her stomach in a clockwise motion. Matryoshka dolls actually originated in Japan or China—depending on which website your cursor lands on—but their attraction is universal. Type “Matroyshka” into your search engine and you’ll find the dolls spanning all cultures and emblazoned on items as varied as nail files, measuring cups and iPhone cases. Matryoshka dolls are one of the most popular souvenirs associated with Russia in the world today, as evidenced by their frequent appearance at the 2014 Winter Olympics in Sochi, Russia. Giant inflatable Matryoshkas topped the snowy slopes of the skiing and snowboarding competitions, and special TV segments took viewers behind the scenes to Matryoshka factories. So what does it take to be a Mother Matryoshka in Next Generation Ballet’s Nutcracker? Top-notch dance skills? Well, not so much. Given the girth of each Mother M and a leg opening that is only 20 inches wide, movement is more akin to marching albeit with pointed toes. More subtle movement is lost on the audience, so there is a lot of rotating, some tilting and a few basic tap steps. More animated movements would be a recipe for disaster—conjuring up nightmare scenes of rolling off Morsani Hall stage in front of 2,000 audience members. 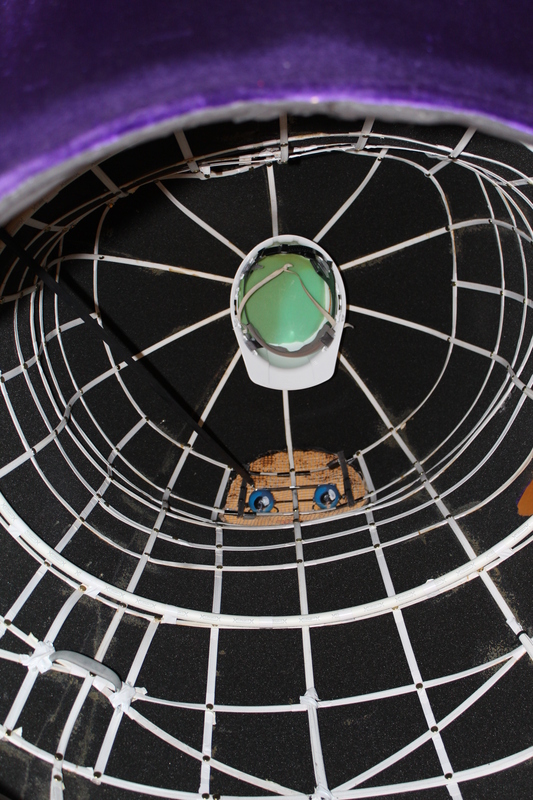 Inside of the Mother Matryoshka costume; the performer wears the hardhat –essentially balancing the costume to wear it. Long for the spotlight? All right, get your ankles ready for their close-up, Mr. DeMille. Because your feet and ankles are the only body parts that can be seen on-stage. Tell family and friends which number in line you arrive on stage to get your fair share of applause. Prone to bouts of claustrophobia? This role is not for you. One of the costumes is brought into the auditions in September, expressly for this purpose. Seven of the eight Mother M roles are typically filled by adult students from the Patel Conservatory open dance program, with the smallest Mother M being a male dancer from the Patel Conservatory Youth Ballet. Can’t commit to rehearsals? Nuh-uh—not going to work. Mother M’s have weekly rehearsals from September through October and then three times a week minimum up until performance time. While the steps are simple, performing on stage with limited visibility and mobility, and with sound cues muffled—in unison with seven others takes a lot of practice. Just as with all other performers, Artistic Director Peter Stark demands perfection. Valerie Hirvela assists Karen Heinemann into her Mother Matryoshka costume for rehearsal. So why, in the midst of a busy holiday season, take the time to be a Mother Matryoshka? Because it is an honor and a privilege to be part of a cast that provides a beloved holiday tradition for so many people. And it is a mother lode of fun! Carol Cohen is a writer, marketer and hoarder of high-quality paper goods. She has been employed by the Straz Center for more than six years, and currently is the Communications Specialist in the Marketing Department. Carol has been an avid student of dance, theater and music at the Patel Conservatory since it opened in 2004. She and her husband Brad run a small business – MindMeld Marketing – that covers a myriad of projects. Carol never misses an opportunity to dress in costume. Ever.